On November 13th and 14th an exalted Chinese delegation of Huazong University of Science and Technology (HUST – 华中科技大学) and Tongji Medical College (TMC) from Wuhan visited the FAU and the Faculty of Medicine. Visiting delegates were Prof. Jian-Guo Chen, Vice President of HUST and Dean of TMC, Prof. Kun Huang, Director of the School Development Planning Office, Ms Ruimin Hu and Ms Catherine Wang, Director and Assistant Director of the International Exchange Office. 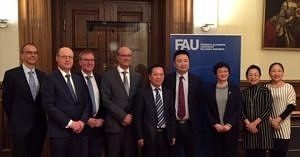 In 2008, a cooperation agreement between HUST and FAU was signed to support scientific collaborations between all faculties of both universities. The purpose of this visit was to manifest existing collaborations and to identify possibilities for new research cooperations, particularly in the medical area. Prof. Dr. Günter Leugering, Vice President Research of FAU, welcomed the delegates of HUST. The extensive exchange was followed by a joint dinner. 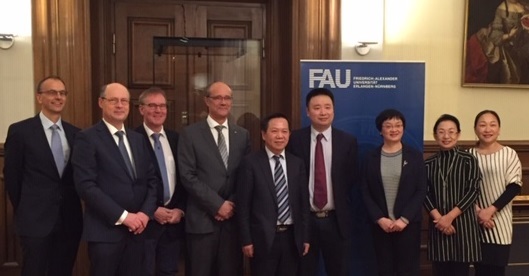 Together with Prof. Dr. Christoph Korbmacher, Prof. Dr. Martin Fromm und Prof. Dr. Dr. h.c. Raymund Horch as well as Dr. Yan Xu-Lackner (Director of the Confucius Institute Nürnberg-Erlangen) major competences, research areas of both universities and existing collaborations were discussed. The Dean of the Faculty of Medicine, Prof. Dr. Dr. h.c. Jürgen Schüttler, welcomed the delegation on the following day. Prof. Schüttler presented the Faculty and Universitätsklinikum Erlangen and worked out the outstanding interdisciplinary research possibilities specific to Erlangen. Through a tour over the medical campus, the delegation gained insight into selective institutes and a variety of research topics. Prof. Fromm and Prof. Dr. Andreas Ludwig presented the Institute of Clinical and Experimental Pharmacology and Toxicology, and Prof. Dr. Matthias Tenbusch guided the group through the Institute of Clinical and Molecular Virology. We would like to thank Prof. Chen and the delegation for their visit and are confident to have manifested the contact and made a starting point for further fruitful collaborations in the future.